Disney California Adventure has stood in front of a mirror, a.k.a. customers, and tried on a few different looks since it opened in 2001. Part of the Disneyland Resort, the theme park has transformed from an assortment of attractions and areas devoted to the vague and all-encompassing California Adventure—Hollywood, SoCal beach piers, the Golden Gate bridge—to a more eclectic mix of regionally inspired areas, such as the elegant Buena Vista St. entrance, and full-on intellectual property dominated areas like Cars Land. The latest development, Pixar Pier, falls into the latter category. Announced in July 2017 at D23 Expo and opened on June 23, 2018, the makeover of Disney California Adventure's Paradise Pier sees the beachy boardwalk area morph into Pixar neighborhoods, with the Incredicoaster as the star attraction. But what's truly different about the new land? Let's walk through the four neighborhoods of Pixar Pier from end to end and look at what’s there now, what used to be there when it was Paradise Pier, and how different it is. Walk under the new Pixar Pier sign (atop which is supposed to eventually sit an animated Luxo Jr. lamp) and look to the right. What used to be Ariel's Grotto, an indoor Disney Princess meet-and-greet, and Cove Bar, a loosely themed outdoor bar know for vibrant boozy concoctions, are now the Lamplight Lounge. The lounge is meant to be themed as a hangout for Pixar's creatives, so it's décor includes concept art, sketches, and touches from Pixar films. How different is it? The downstairs area (once Ariel's Grotto) is completely changed with a light, energizing aesthetic. Gone is the prix fixe menu, and in its place a menu of bites and drinks worthy of any gastro pub. The upstairs area (once Cove Bar) looks mostly the same, with some of the signs referencing Paradise Pier swapped out for ones mentioning Pixar Pier. The menu's the biggest change upstairs. You can apparently still order from Cove Bar's legendary secret drinks menu, but even those may not be what you remember. You'll find Knick's Knacks across from Lamplight Lounge. Named after the star of a 1989 Pixar short, the merchandise shop has the same bones as before, but the interior is brighter and more open with about 100 percent more Pixar offerings. How different is it? This is now your one-stop shop for Pixar gear, including merch highlighting a variety of characters, even those that don't feature prominently in the rest of the land, and Pixar inspired snacks like Inside Out popcorn. As you head towards the rest of the pier, you’ll find Adorable Snowman Frosted Treats has moved into the spot formerly occupied by Paradise Pier Ice Cream Co. The premise is inspired by the friendly abominable snowman in Monsters, Inc. who swore his yellow snow cones were tinted because of lemon. How different is it? The structure is the same, but it has new themed signage. You can still get the chocolate and vanilla soft serve previously available at this location, and you can try new dairy-free lemon soft serve concoctions. How different is it? The track and ride vehicles are the same; you’re not going to be thrown for an unexpected loop. Aside from some general sprucing and repainting, the launch is slightly different, the scream shields have become fully enclosed tubes used for effects, and show scenes bookend the zoom around the tracks. And hey, the attraction has a story now as it follows the Parr family as they trying to track down a missing Jack-Jack. The tight turnaround time for the Pier transformation means not everything is complete. The new carousel, Jessie’s Critter Carousel, won’t open until 2019. How different is it? I hope you said goodbye to the sea creatures of King Triton’s Carousel because they’re gone. The ride mechanics are staying, but all the animals (seats?) will be replaced by critters from the “Woody’s Roundup” television show seen in Toy Story 2. Paradise Pier had food stands and carts with standard Disney Parks fare like cotton candy, churros, and turkey legs. The Pixar Pier replacements have all those items and more unique offerings served from the counters of newly themed facades. How different are they? You can pick up new snacks (most of which I discuss here) from four Pixar-inspired stalls: Jack-Jack Cookie Num Nums, Poultry Palace, Señor Buzz Churros, and Angry Dogs. Toy Story Midway Mania, in the Toy Story Boardwalk neighborhood, has been part of the pier since 2008 and hasn’t gone anywhere and hasn’t changed. What’s a boardwalk without pay-to-play games? Dumbo Bucket Brigade, Casey at the Bat, and Goofy About Fishin' were replaced by Wall-E Space Race, Heimlich's Candy Corn Toss, and La Luna Star Catcher respectively in the Pixar Promenade neighborhood. Bullseye Stallion Stampede stayed put. How different are they? One of the games is the same, while the other three use the same gameplay techniques with fresh theming. The prizes for games are better across the board, with cute Pixar plush up for grabs instead of sometimes random toys. Mickey’s Fun Wheel is one of the most recognizable features of the Pier, and as such, the Mickey on the front of the attraction didn’t change, even though it’s now called Pixar Pal-A-Round. How different is it? The ride is the same to experience, but the exterior is almost completely different to look at. Each gondola shows off a brand-new repaint with bright colors and portraits of different Pixar pals, like Miguel and Hector from Coco. Opening in late summer 2018, Bing Bong’s Sweet Stuff, part of the Inside Out Headquarters neighborhood, looks like it will take over the area formerly occupied by shops like Sideshow Shirts and offer way more confections. How different is it? To be determined. The space that was home to the Maliboomer has been vacant since that ride was dismantled in 2010. 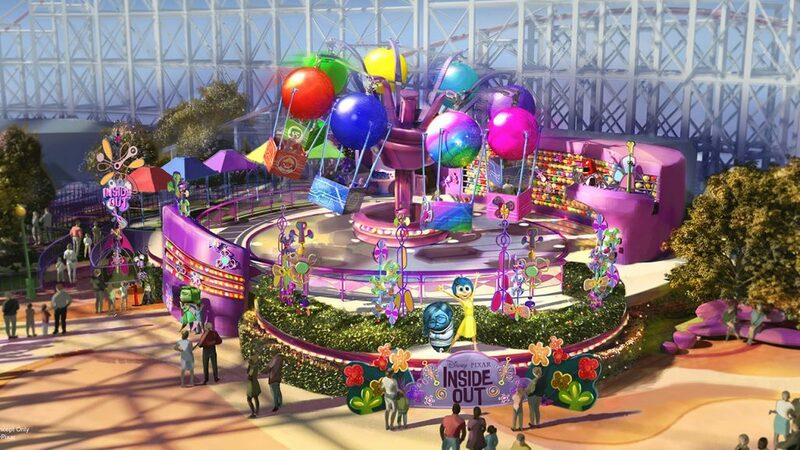 In 2019, the Inside Out Emotional Whirlwind will occupy the space to round out Pixar Pier. How different is it? The Whirlwind will be completely different from Maliboomer, but it looks an awful lot like a repainted version of Flik’s Flyers, which is slated to close with the rest of A Bug’s Land in late summer 2018. The best food on Pixar Pier. Opening dates for Star Wars: Galaxy's Edge. Disneyland's Loki meets a little girl dressed like him.